The British Film Institute (BFI) on London's South Bank exists to promote greater understanding, appreciation of, and access to, film and moving image culture in the UK. Following a scoping study, we developed and supplied the British Film Institute's 'Stills Image Management System' based on our ImageIndex+ software. The system has terminology controls for accurate cataloguing, powerful search facilities and automated order fulfillment functionality. An Index+ image acquisition pipeline automates the image processing and the capture of technical data. Prior to supplying any software, we were asked to perform a 'Digital Scoping Study'. 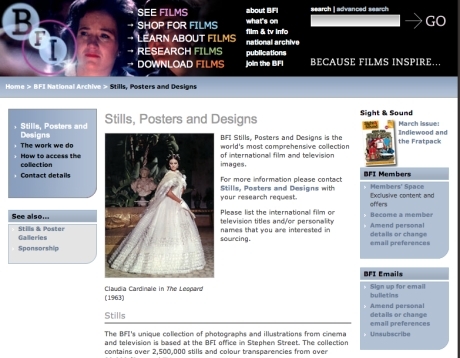 We advised the BFI on the best ways to use digital technologies to extend access to its existing archives and to assist in the collection and curation of new assets. The emerging national and European policy frameworks for building and exploiting digital cultural assets, combined with the rapid evolution of underlying technologies, means there is a great deal of activity providing access to digital assets across the cultural sector. Indeed, cultural institutions now have to define themselves as much by their ability to provide electronic access to resources as by the traditional roles of knowledge generation and preservation.